My first website ever created was titled "Dragons of Destiny". This website was created for a small LUNAR fan-club that I created on America Online. Many of the DoD members are still around today on the forums here at LunarNET. This club had been modeled after the famous Althena's Court Online, which had since died off by the time Dragons of Destiny came into being. After a few months of running Dragons of Destiny, we merged with another Lunar club, Dragons of Lunar. These clubs eventually merged into a newly born Althena's Court Online, which I ran up until summer of 1998 when I handed the club over to NallWdrgn. Around the time of Dragons of Destiny's death as a club, I started up a new website called Video Game World. After a few months, the site lost it's host and VGW closed up. This was about the time that the idea of LunarNET came into my head. I wanted to create an ultimate website that focused on Lunar, but had the size of a Dave Z's Sega-Saturn.com. At this time, I had been posting on the ever-famous Lunar Threads forum, which was hosted over at Dave Z's. I bragged about this new "Lunar site" for months on the Lunar Threads and over at ACO. I think most people started just saying "yeah awesome!" just to get me to shut up about it. :P But I started desiging the website in November and was having a hard time coming up with a good name. I can't remember who told me to go with LunarNET, but it sounded good to me becase of the Lunar theme. On Christmas Eve of 1997, I put LunarNET up for the first time at the address: http://lunarnet.simplenet.com. I had the site and even a few sections up and running. The original version can still be found here. After working for a few weeks on the site, I started building up a small staff. Most specifically, Webber and Rudo. Apparently around this time is when people started to take notice of LunarNET. At the time, many gamers were pretty mad at Sega for not releasing some pretty sweet titles (Phantasy Star Collection, Grandia, etc) on the dying Sega Saturn machine. Grandia was the one I was irked about. Apparently someone else was none too happy either. I got an EMail from Lunar Threads regular, Webber, who suggested we start a petition for the release of Grandia by Sega. Gee, we thought, what better place to host it than LunarNET? So thus began the first major project of LunarNET. A few days after Webber joined the staff and the Grandia petition got started, another Lunar Threads old-timer contacted me with something Grandia-related. Rudo had been collecting a HUGE Grandia media archive on his harddrive over the previous few months, and wanted to house them in what would be one of the biggest pictures archives LunarNET would have for some time. LunarNET was fast becoming GrandiaNET for a while there. :P Rudo, like Webber, went on to join the LunarNET staff. It also got to the point that the Lunar-only theme became more of a niche-gaming theme. Thus we started working on something that would eventually get pretty dang big. Rudo, like Webber, also came up with a pretty nice invention to bring in more visitors: A gaming network! At this time, a sister site of LunarNET was forming by the name of GameNET, run by other members of the Lunar Threads and headed up by Lunar Threads old-timer, SegaBoy! (who ironically now works for Nintendo) Other websites joined up with us to try and start a network, but unfortunately, the network ended up failing, and LunarNET and GameNET just continued on as sister sites. Unfortunately, the Grandia petition also "failed", though we still saw the game on the Playstation via Sony. Even though those two major projects failed, LunarNET itself gained quite a bit of traffic out of it, and was growing at a rapid pace due to great reviews and from Webber's work at getting hot news up fast. At that time, we picked up a few new editors in Commodore Wheeler, E-Chan, and EsquE. Webber pushed on with news story after news story, and Rudo and I worked on the back-end making sure all the Coming Soon pages came sooner rather than later. E3 '98 was a blur, and while I didn't get to go, Rudo and Webber brought the house down with great interviews, tons of movies, and pics of the newest games. Many things happened in those first few months: we scored some exclusive FFVIII pics and got linked by many sites such as GameSpot, IGN, Next Generation, and GameFan, which was pretty unheard of for a "small little fansite". Around the time of E3, we also redesigned the site. Quite a few other things happened over the course of LunarNET's history. ECM of GameFan sourced editor E-chan's wonderful Grandia translation in the magazines Grandia review. 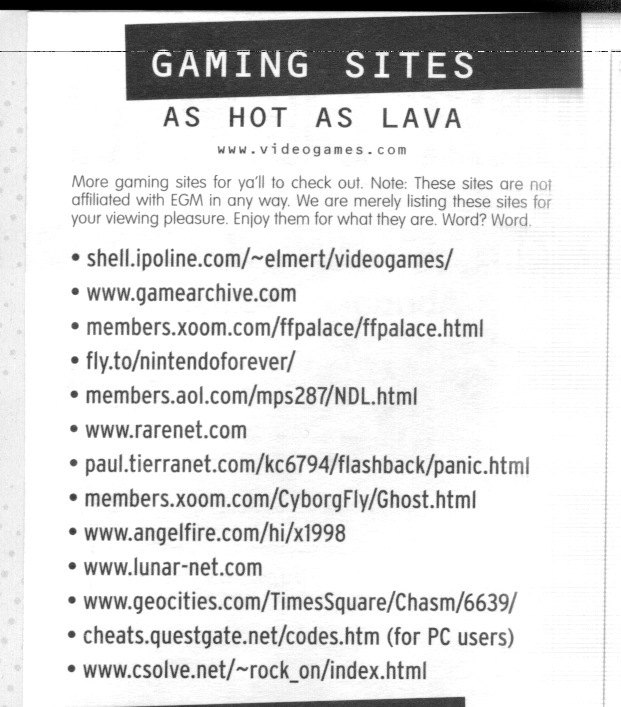 We also had our URL mentioned in a EGM magazine for being a "Cool Site of the Month", the scan is still viewable. We also finally lost our Simplenet server due to someone who hacked into the LunarNET server and decided to run a warez server on a directory I never checked. That was all fine and dandy because we moved to www.lunar-net.com a few months before and were just using that server for hosting movies. We always wondered why that server became so slow for it's last few months... :P That was the first time LunarNET was hacked and it wasn't the last. In late spring of '99, Rudo and I decided the name LunarNET might have been the reason our traffic hadn't been increasing as much. Eventually someone came up with the name RPGFan. And thus today it stands with Rudo still in charge! After the name-change, I started loosing interest in RPGs, and eventually resigned from RPGfan in February or so of 2000. Around that time I had also been working on a new wesite for a gaming magazine known as Silicon Magazine, and while it was cool getting free games for my efforts, it just wasn't that fun anymore. Gaming was just getting old, and I was becoming tired of the entire fansite ordeal. A few months later, I recieved a notice in the mail saying that unless I renewed it, I would be loosing lunar-net.com domain ownership. I renewed it, just to keep the domain name ownership, but then started thinking about the great fun I had with the old LunarNET. I decided to bring it back, but just as the original goal was, Lunar-only. I took the Lunar special I had been working on since the beginning of LunarNET's existance, and transferred it to the newly designed LunarNET (Chronologist gets rights for this particular design). After a few attempts at running a new LunarNET, I just didn't feel it was the same anymore, and just left the "Lunar special" up and practically quit working on it. I had become pretty burnt out on games in general, and about the only games that even held my attention anymore was the Lunar and Suikoden series and an occassional multiplayer game here and there. Fast forward to 2001. I was finishing up at the Junior College, getting ready for life at the University, and needed a project for a few webdesign classes. Thus, LunarNET v.3 was born! However, after about 9 months of running the site, I just couldn't keep up with it anymore. I was spending more and more time in my classes, and after talking it over with the staff, I handed the site over to Drumlord, who turned what we had built into the mega-site GamesAreFun.com. However, I also brought back the LUNAR special once again! It didn't last long until I decided a redesign was needed and around July of 2002, I unvieled the 7th version of LunarNET. Ever since then, LunarNET has remained and will always remain a Lunar-site only. Over the next two years, we built content up. Later that year, a wonderful thing happened to LunarNET. We were contacted by UbiSoft, who had just gained rights to publish the new handheld version of LUNAR on the GameBoyAdvance. They asked us to use our Lunar Legend section as the official website for Lunar Legend. This gained us some more respect from the LUNAR fandom, and even had us mentioned in UbiSoft's Lunar Legend ads in Play! Magazine and Nintendo Power. Two years later, in November of 2004, UbiSoft rang again. This time, a brand new title (non-remake) was in the works. They brought both me and Kizyr in to help with continuity, and again to house the official website for the new LUNAR title, Lunar Genesis. About this time, I also decided that I needed to get this site cleaned up a bit. I ended up undertaking a giant project to completely overhaul the site, taking all the old content such as merchandise, multimedia and interviews, and adding it with so much new content that no other Lunar site could even come close to having. Over 14,000 screenshots of the main four games alone, complete libraries of merchandise information and pictures, tons of multimedia, and much more were completed. This also included a complete redesign of the site. This was opened on LunarNET's 7th birthday, December 24th, 2004. Eventually, Lunar Genesis was announced around March of 2005, and LunarNET did some exclusive stuff with this new title, having again been chosen to become the official site. One of the cooler unique things that UbiSoft had us do was a poll to determine a new name for the title. The results of this poll gave us the name Lunar: Dragon Song. Again, LunarNET was pimped out in magazine ads in numerous gaming publications. Lunar: Dragon Song was eventually released in September of 2005. Things have been fairly quiet since then, but that's given us a chance to put up some exclusive content not found anywhere else. Kizyr, especially, has done a wonderful job putting up things like summaries of the Japanese novels and manga among other translation work. 2007 marks a big year for LunarNET, as we turned 10 years old on December 24th. This also marks LunarNET v.10, which we feel is by far, leaps and bounds the best design yet for this site. This concludes our history. Hopefully the future will continue to be bright for LunarNET!